We are growing our articles regarding rhodium coins, rhodium bullion, rhodium bars and pretty much anything dealing with investing in rhodium, expanding on our idea of a "rare precious metals site." "Where Can I Buy Rhodium Coins Rhodium Bullion?" "World's First .999 Rhodium Coin: Interview with Eitan Cohen of Cohen Mint"
"Rhodium Bullion Coins, Cohen Mint Interview Update"
"Interview with Eitan Cohen (Topic: Rhodium Coins)"
"1 Oz Rhodium Bar & 1/4 Ounce Rhodium Coins in Dec 2009!" "Behold! 1-oz Rhodium Bar in My Hands! (2011)"
Check back, because there will be many, many more to come. Heck, if you have something to share and moderate writing skills, send us a mail and help build our collection! So why not link to these posts you mention? I'd love to get ahold of a few ounces. I just loaded up on 50 oz of palladium. Post the links, please! Colnector, the text "Rhodium Info and Rhodium Posts Here!" 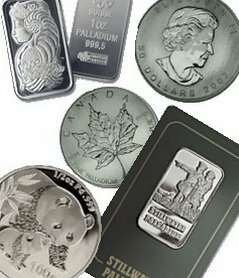 is actually a link to the rhodium posts on this site. Is it not working? I just clicked it and it works fine for me. If it doesn't work for you please let me know! Anonymous, yeah, I'd like to have some too. When PGMs move, rhodium will move more than the others. 2nd movers will be silver and palladium, if you ask me! Isn't rhodium brittle? I thought that's why it can't really be turned into coin form. Yes, rhodium is pretty brittle. If you have pure rhodium in the form of a rhodium coin or bullion bar and drop it on the floor it might crack. It's not going to shatter into a million pieces, but for the regular person, it's not a good metal to make a coin out of. If it remains in a padded plastic case and isn't dropped it should be fine. I want a few ounces also. Couple of bars. Where can I find them? Hi, this is Eitan Cohen with the Cohen Mint. We are going to be the worl's first producers of a pure rhodium coin, you can google us. I would like to have the opportunity to answer some questions about rhodium. Although Rhodium is brittle, this word is used in metal terms, much like gold is called "soft". Everyone who has ever held gold in their hand knows that gold is very very hard, it takes a lot of effort to bend or dent it, but as compared to other metals, it is indeed soft. Rhodium is quite solid, you can drop it, throw it, it will not shatter like glass, it will behave like a metal. What makes it "brittle" is in comparison to other metals, it does not like to be stamped, or rolled, or formed using traditional methods. Whenever you try to form this metal using traditional methods that work on softer, more ductile metals, Rhodium will tend to snap, break, and flake. It does this in a press, or a rolling mill, it wont break in your hands.